1. Tool Structure Jumbo Rake Comb - I purchased this comb at Sally's a while ago and its my most used grooming tool. 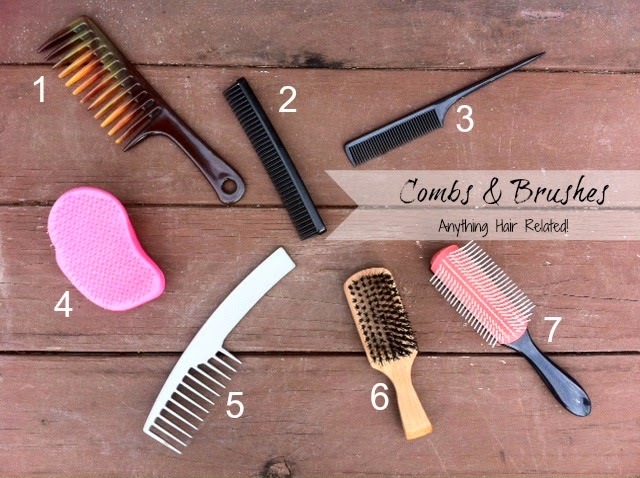 I use this comb for de-tangling and everyday combing needs. It's the ruler of the whole bunch. 2. Tool Structure 3 Row Styling Comb - This is my flat ironing comb, that I use to do the chasing method with, that I also purchased at Sally's. I only use this comb on my blow dried hair and chase it with my flat iron. It has 3 rows of teeth that help separate my strands and gives me sleek flat iron results. I don't comb my hair with this comb ever lol. 4. Tangle Teezer Detangle Brush - When I first purchased this from Sally's, I tried to use it as a detangling brush. Ehhhhhh...it didn't work for me because of my hair texture and I ended up breaking some strands. It is a great detangler but for me it only works in small sections on wet hair. Currently, I only use the tangle teezer to smooth my hair into a ponytail. I think its less damaging than using the bristle brush. 5. Goody Wide Tooth Comb - I have had this comb since I was a little girl and I haven't seen one like it in stores since but I think there are similar ones in stores. I use this comb only on my straightened hair to comb, wrap, and detangle my hair. 6. Urban Essence Boar Bristle Brush - This is a bristle brush that I bought at the dollar store about a year ago. I'm pretty sure it's not made of 100% boar bristles but there are a few in there so they can name it that lol. It gets used very seldom. I only use it on my edges from time to time, or I'll use a tooth brush which I didn't include in the photo. (A new cheap toothbrush that I keep with my hair tools...not the tooth brush I use on my teeth lol) Tooth brushes work great on my edges. That's it. Those are all the tools I use to style and groom my hair with. What type of tools do you use? Please share them or let me if you use any of the tools I listed. 2 comments on "My Grooming Tools & Their Jobs"
Nunca Jamás! LOL @ your Denman Brush. I only have one comb and I almost never use it anymore: my Magic Start Jumbo Rake. Although it's amazeballs---I realized that it's just too easy for me to rip through tangles and knots when I use a tool vs when I only use my fingers. I've been exclusively finger combing for a least 6 months and I can honestly say that I do not miss my combs! LOL at my spanish. And yes my fingers are the best combs I'll ever have...I am slowly but surely veering away from my tools.